Mirpur district (ضلع میر پور) is a district in Azad Kashmir. The district is named after the main city, Mirpur. The district of Mirpur has a population of 456,200 and covers an area of 1,010 km2 (390 sq mi). The district is mainly mountainous with some plains. Its hot, dry climate and other geographical conditions closely resemble those of Jhelum and Gujrat, the adjoining districts of Pakistan. During the British colonial times, Mirpur was one of the five districts of the Jammu province in the princely state of Jammu and Kashmir. According to the 1941 census, the it had a population of 386,655, roughly 80% of whom were Muslim and 16% were Hindu. It consisted of three tehsils: Kotli, Mirpur and Bhimber. Kotli and Bhimber have since been made into separate districts. The three districts constitute the present day Mirpur Division in the Pakistan-administered Kashmir. Small portions of the erstwhile Mirpur district are also included in the Rajouri district in the Indian-administered Kashmir. The original Mirpur district, along with the districts of Poonch and Rajouri, had close geographic, ethnic and cultural connections with West Punjab, more so than with the Jammu city and the rest of the Jammu province. Due to these reasons, scholar Christopher Snedden states that the people of Mirpur had a strong desire to join Pakistan during the Partition of India. There is considerable ambiguity surrounding the name of the local language: its speakers call it variously Pahari, Mirpur Pahari, Mirpuri and Pothwari, while some label it as Punjabi. Sociolinguists have regarded it as one of the three major dialects of the Pahari-Pothwari language complex, which is intermediate between Lahnda and Punjabi. Mirpur Pahari is mutually intelligible with the other two major dialects – Pothwari of the Potohar Plateau in Punjab and the Pahari spoken to the north in Azad Kashmir and around Murree – and shares with them between 77 and 84% of its basic vocabulary, although the difference with the northernmost varieties (in Muzaffarabad) is sufficient to impede understanding. Mirpuri speakers have a strong sense of Kashmiri identity that takes precedence over linguistic identification with closely related groups outside of Azad Kashmir. Another language spoken here is Gujari. The local dialect is closely related to the Gujari varieties spoken in the rest of Azad Kashmir and in Hazara. Other languages spoken include Urdu and English. 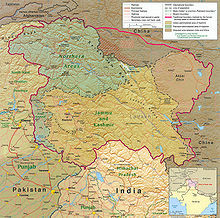 The vast majority of the district's population belong to the Jatt ethnic group followed by Rajputs and Gujjars. The rest were lower caste people known as massalis up to the 1950s. They included artisans like nais, chamars, mochis, telis and others. These groups eventually left their massalin Mirpuri Potohari; the Majh and Gojri dialects of Punjabi Language are now the predominant languages of the district. Kakra (town) - Located 12 km from Mirpur - comes between Mirpur and Islamgarh. is famous for its Sufi shrines. Mangla, a town 16 km from Mirpur; it is situated at the mouth of the Mangla Dam. District Mirpur stands at number 12 nationally in the ranking related to education with an education score of 72.16, according to Pakistan district education ranking 2017, a report by Alif Ailaan. The learning score is at 80.94 and gender parity score of 84.26. Retention score is low at 51.27. The reason for low retention score is that the number of schools which cater to beyond primary are far less than primary schools. Media of Mirpur district is evolving day by day and a number of the media company are taking interest in Mirpur and launching their newspaper as Mirpur edition Daily Mahasib started its journey in February 2006 other newspaper also launched their Mirpur edition like daily Adalat, daily Shaheen, Daily Kashmir express. they all provide daily Mirpur news, International news, national news, political news, sports, entertainment, showbiz, commerce, business news. Erstwhile Mirpur District (including present-day Bhimber District) has a considerable refugee population (like refugees in Karachi) They are from almost all the castes; however, Mirpur (especially Tehsil Dadyal) has predominantly Jat and Gujjar caste refugees. The villages of Jat refugees in Tehsil Dadyal are Mohra Kanyal, Malkan and Mehndir Colony. A vast majority from Mohra Malkan has shifted to Village Khairowal Jattan, Tehsil Barnala, Distt Bhimber in 1974 where each family was allotted 64 Kanals of agricultural land. However, many of the families which shifted to Khairowal or Chamb still have nostaligic feelings of their days in Dadyal and great people of Dadyal. They do not miss an opportunity (funeral, weddings, festivals) to enjoy their occasional reunions with the inhabitants of Mohra Malkan and other nearby villages like Chapran, Mehra etc. Afzalpur, Abdulahpur, Andrah Kalan, Arah Jagir, Ballah, Pakhral, Bajjar, Banni, Bongdawara, Burjan, Chabrian Dattan, Chak Haryam, Chakswari, Chandral, Chak Sagar, Chatan, Chechian, Chitterpari, Dalyala, Dheri Thothal, Rathoa, Ghaseetpur Awan, Ghaseetpur Sohalian, Islamgarh, Mora Rakhyal Mora Loharan, Mora Rathyan, Mankarah, New City', Tariq Abad„ Jatlan, Jangian Kotla, Kakra, Kalyal Bhainsi, Kas Kalyal, Khari Sharif, Khokhar, Mehmunpur, Mori, Nagial, Pindi Subherwal, Potha Bainsi, Sahang, Saleemabad, SukhChainPur, Nawan Garan, Gorsian, Chak Ghayan, Raipur, Palyala. Amb, Chattroh, Haveli Baghal, Kathar Dilawar, Mandi, Mohra Malkan, Mohra Sher Shah, Rajoa, Ratta, Sahalia, Siakh Pahaith, Thalarajwali Khan, Thub Jagir, Ankar Raajgan. ^ Karim, Kashmir The Troubled Frontiers 2013, pp. 29-32. ^ Snedden 2001, p. 118. ^ Snedden 2001, p. 112. ^ Snedden 2001, p. 120. ^ Lothers & Lothers 2010, p. 100. ^ Lothers & Lothers 2010, pp. 2–3, 5, 19, 100. ^ Lothers & Lothers 2010, p. 44. ^ Lothers & Lothers 2010, p. 2. ^ Shackle 1979, p. 201. ^ Lothers & Lothers 2010, pp. 2, 24. ^ Lothers & Lothers 2010, p. 86. ^ Pakistan's caste system: The untouchable's struggle, The Express Tribune, 31 March 2012. Hallberg, Calinda E.; O'Leary, Clare F. (1992). "Dialect Variation and Multilingualism among Gujars of Pakistan". In O'Leary, Clare F.; Rensch, Calvin R.; Hallberg, Calinda E. Hindko and Gujari. Sociolinguistic Survey of Northern Pakistan. Islamabad: National Institute of Pakistan Studies, Quaid-i-Azam University and Summer Institute of Linguistics. pp. 91–196. ISBN 969-8023-13-5. Shackle, Christopher (2007). "Pakistan". In Simpson, Andrew. Language and national identity in Asia. Oxford linguistics Y. Oxford University Press. ISBN 978-0-19-922648-1.